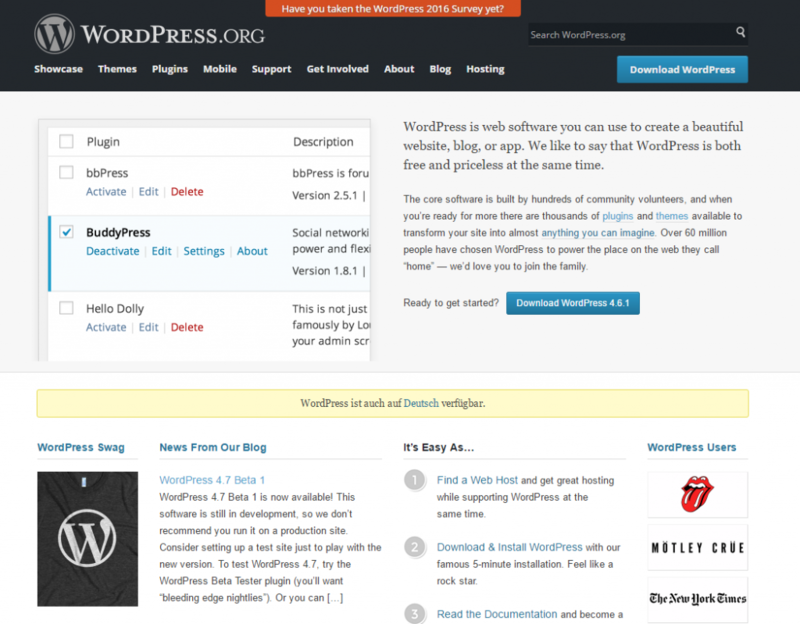 If you have heard about WordPress, it seems to be the coolest software on the Internet so far. But what is WordPress and how can you benefit from it? This article will give you answers to the ten most pressing questions that people have about WordPress. WordPress is a Content Management System (CMS). Sounds intimidating? Well, it’s not as complicated as you think. If you have seen sites like Squarespace or Jimdo, these are CMSs too. It just means, that you as the owner of the site, can make any changes by your own. Meaning: You don’t have to cash out money every time you need a phone number changed on a page. WordPress comes to you as software, but you don’t install it on your home computer as you do with a word processor. You install it on somebody else’s computer, who has their computer connected to the Internet 24/7. This other person is called a web hosting company, and their computer is called a web server. All these are self hosted solutions, which means that you rent a space on the Internet, where you can install the software and run it on your own. It’s a bit like renting a computer that is always connected to the Internet. The original creator of WordPress is Matt Mullenweg, and he created his company Automattic in 2005. He registered WordPress as a trademark but donated the trademark later to the WordPress Foundation. This Foundation is a non-profit organization that ensures that WordPress is freely available for everyone. 3. What does WordPress cost? WordPress is an Open Source project. It means that a lot of people are developing the software together for free. Yes! You did read that right. For free! Many of these developers are working for companies, who use WordPress for their own commercial sites, or who sell WordPress related products or services to paying customers. That works, because not everybody feels comfortable setting up their own website using WordPress, even though it is easy to do. Larger companies, who want to use WordPress for eCommerce, like to hire external specialists who can set up the more complicated things for them. This is how WordPress developers earn money by providing technical knowledge, offering regular maintenance like update services, or custom programming for individual design and functionality. 4. What is the philosophy of free Software? 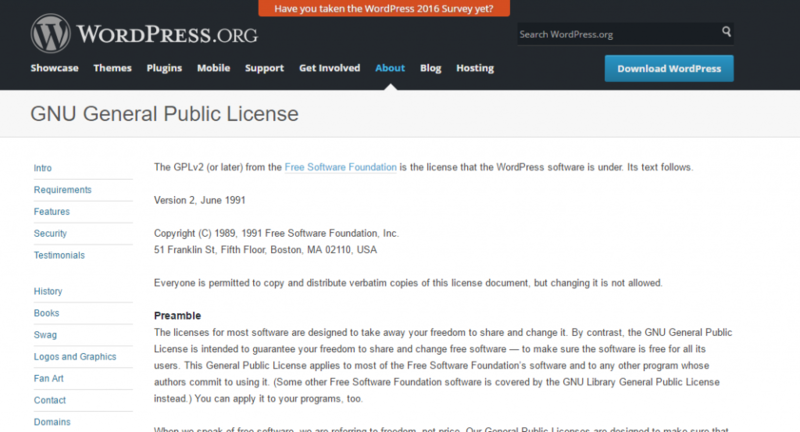 The makers of WordPress believe in free software (free as in speech, not free as in beer). Meaning that software should be free to use, modify and distribute by everybody. It does not necessarily imply that you can get all of it free of charge. But even when WordPress itself is free to download and use a free license, you may end up with some costs, when you want to use it for your business. If you want to use WordPress for your website you need to get some hosting. Even though you can use a cheap web hosting for $3.50 per month, you might want to spend a little more for increased speed, security, and support. This is where the managed hosting comes into play. Some web hosting companies specialize in WordPress hosting, and they offer some features that come in handy when you use WordPress, for example by providing a free copy of your existing site, in case you need to do some testing without disturbing the live site. This is called “staging” and you need it when you get a developer working on your design or additional features that you want to add to your site. Also, some plugins and themes offer features that you don’t find in the free version. These theme designers and plugin developers charge for these extra options. For example, WooCommerce is a free plugin to enable your WordPress site to sell products. But you will need some functional integration sometimes for example when you don’t want to use just the standard PayPal system for the payment processing. WooCommerce offers a lot of “extensions” that handles these special requirements. Also, there are a lot of specialists around, who can help you with any problems that you might have with your WordPress installation, plugins or updates. Either your pay these services by the hour or they have a fixed price that you need to negotiate beforehand. 5. Is there a difference between WordPress.com and WordPress.org? Yes, there is. 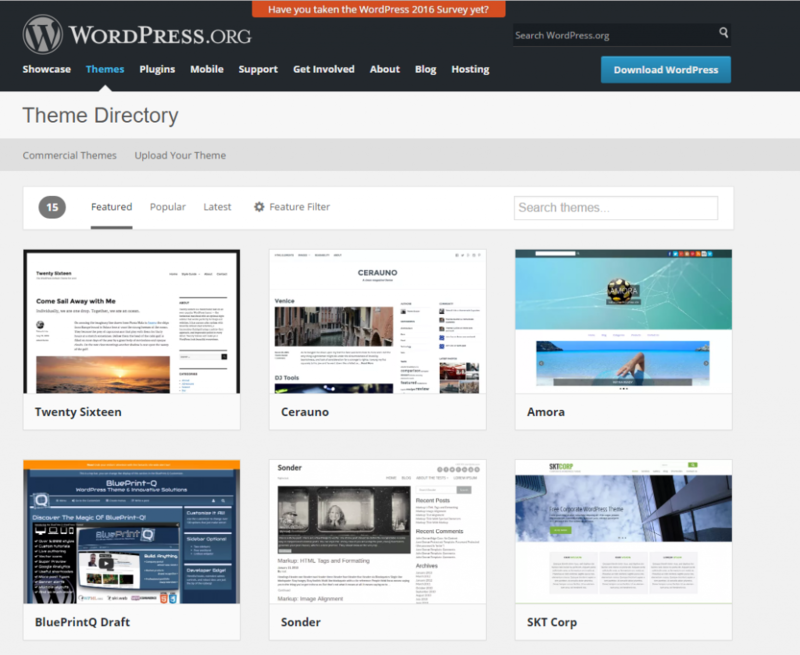 WordPress.com offers a hosted service, where you can create a free or paid account. It’s also running the WordPress software, but you don’t own the site. You are limited to the design options (themes) that they offer and you are not allowed to extend your site with additional functionality (plugins). WordPress.org is the place where you can download the WordPress software and install it on a web server of your choice. All you need to do is to find a web hosting service that will meet your requirements and budget. Most of these start with a monthly fee as low as $3,50. The advantage of your own website (using the software from WordPress.org), is that you have full control over your content, your design and the functionality that you want to add. The disadvantage is that you have full control over your site, which means that you are responsible for keeping the software up-to-date. 6. How do I select a design with WordPress? The design of your website is determined by a “theme” which you can also download from WordPress.org. They have a theme directory that contains over 4000 free themes that you can choose from. It that’s not enough, or if you can’t find one that is to your liking, you can even pick one from several thousand premium themes that companies offer for various prices. 7. How do I add more functionality to WordPress? Do you want to have a contact form somewhere on your page? What about a photo gallery? Maybe a small online store? All this can be added to your WordPress site by a “plugin.” WordPress.org has a plugin directory that holds about 47.000 free plugins. Some of them are small programs to make things easier for you; some will add small functionalities like the contact form, but others are really powerful like the eCommerce plugins. Not all are easy to install and to set up. This is where the paid specialists come in again. But most plugins are just quick and easy to install, and they provide additional features that will enrich your website. 8. How secure is WordPress? Software like WordPress is as secure as any other software that is running on the public Internet. It’s constantly attacked by hackers who try to get into your site, guess your admin password, deface your website or abuse it to sending spam mails. How safe your installation really is, depends on how serious you take software updates. Remember? Software updates, like you, do for your Windows system (or Mac-OS if you are a Mac user). You have probably set your computer on automatic updates so that you don’t have to remember to check for updates every day. And this is what you should do for WordPress too. If this sound scary to you, just keep in mind that even large companies like Yahoo got hacked in the past. So even if your website may not be very popular (yet), you might get visits from hackers eventually. That is the reason why you should always keep WordPress up to date. It can be configured to update itself when a new version is available, and I really recommend doing that. The same goes for your WordPress theme and all the plugins that you have installed on your site. So if you don’t check for updates daily, use a plugin that will check for new updates for you (like Wordfence security). If you keep all software on your site updated, WordPress is pretty secure. You have to have a strong password for your user accounts so that nobody can guess them. Apart from that, you can use special security plugins that can scan your site for unauthorized changes or known malware. So it’s nothing that you can’t handle with a little bit of time that you spend on keeping the system up-to-date. 9. Who is using WordPress? WordPress is used by a lot of small companies, bloggers, and small online stores. But it’s also used by larger companies. If you look up “who is using WordPress” on Google or search for “companies using WordPress” on bing.com, you will get some information on who is using WordPress. Make sure you limit the search to just the last month or last year, so you don’t get old articles. Large companies may change their online strategy over time, so the older articles might point you to fortune 500 companies who did use WordPress in the past but have switched to another solution in the meantime. WordPress is not always the best option for large firms. Some of them decide to build their own system because they can spend Millions of dollars every year for a team of developers and they have special requirements where they need to optimize their site. For example, when they need to tweak the site to maximum performance and minimal response time, it may be necessary to build the software from scratch. If you check the statistics (https://w3techs.com/), WordPress is already powering 27% of all websites on the Internet, and that’s including hard-coded sites and pure HTML driven sites. If you just compare sites that are using some kind of Content Management System, the market share of WordPress is over 58% (as of November 2016). You can see that most WordPress users are using WooCommerce as an eCommerce solution. WooCommerce is a free plugin that you can add to your WordPress installation. 10. Who can help me with my WordPress site? If you are just curious to get started with WordPress, you can try out some free video courses that you will find on youTube.com, udemy.com or skillshare.com. For example, I offer a free WordPress course for beginners at Skillshare and Udemy just for the basic installation. You can also buy a book or an eBook to get started. I have published a bunch of short step-by-step Kindle eBooks, which give you all necessary instructions to get up to speed with the installation and your first site. I’m currently translating them into English so that they will be available soon on Amazon.com. If you feel overwhelmed with the details after you have added more plugins and set up more pages for your site, you can get qualified help on the Internet. Portals like UpWork.com have programmers who are willing to help with any problem that you might have. Unfortunately, not all the programmers on these platforms are specialized on WordPress and the quality of the service can vary from person to person. An even more excellent source is codeable. Unlike UpWork, they only have WordPress experts who are hand-picked by the codeable team. They will give you an estimate on the final cost before you hire anybody. This way you can be sure that you get your problem solved for a fixed price. I have done this for several years on UpWork and codeable, fixed a lot of broken WordPress installations and supported my clients to modify designs and features for their sites. 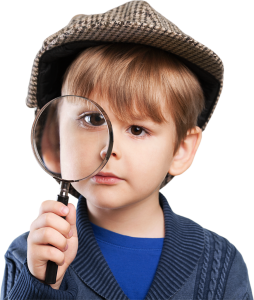 Disclosure: The links to codeable and skillshare are affiliate links. This mens that I will get paid a small compensation for bringing new customers via the link but you don’t have to pay more for the services when you use these links. Nevertheless, all my recommendations are based on my personal experience with the service and I recommend them anyway. If you don’t think I deverve a little compensation for the recommendation, you can enter codeable.io or skillshare.com to your browser address bar manually or just look it up on a search engine like Google or Bing.